Many hardships faced the children of Europe during World War I. Economic difficulties became prevalent among mothers struggling to support themselves and their families while their husbands were fighting the war. Many European households suffered from malnutrition due to food shortages and a lack of money. Schools were closed and used for military bases. Children were forced to work in positions left vacant by conscripted soldiers. While most parents attempted to make enough money to provide for their children, some children found themselves in orphanages during World War I. Loss of parents through death or imprisonment was one of the major effects of World War I. Thousands of children in France and other European countries were left parentless and were forced to live in orphanages created to protect them and provide for their basic needs. Life in the orphanage required constant funding from outside donations. Various individuals and organizations created campaigns to raise support for orphans of the war. United States servicemen participated in fundraising efforts for children who had become orphaned by the war. How are children affected by war? Explain Germaine's situation using evidence from the photograph. 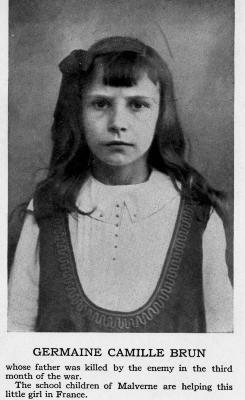 Photograph of Germaine Camille Brun, whose father was killed by the enemy in the third month of World War I. The school children of Malverne helped the French orphan, c. 1917. When was Germaine’s father killed? Research French orphanages from WWI and answer the following questions. What was life like in a French orphanage during this time? How many children lived in these orphanages? Do you think life in the orphanage was a good or bad experience for these children? Art: Draw a picture of how you think Germaine’s orphanage may have looked. Math: If it cost six dollars a day to support a French orphan, how much did one orphan cost the orphanage for one year? How much did it cost to support 250 orphans for one year? English Language Arts: Write a fictional entry from Germaine’s journal. Remember to include information about her life at the orphanage and what her life might have been like before the orphanage. Tucker, Spencer and Priscilla Mary Roberts. Encyclopedia of World War I: A Political Social and Military History. ABC-CLIO, 2005.